A young woman with psychic powers gets involved with a murder investigation. Sam Raimi’s come a long way since 1982, when he made such an impression with the visceral Evil Dead. Fans of the late lamented American Gothic TV series will love this movie, which shares many of the same themes and has a similar atmosphere. (It even features American Gothic star Gary Cole in a cameo role). The movie has received a very nice anamorphic 1.85:1 transfer. The 5.1 audio mix (at 448kbps) is unexpectedly modest, but is nicely polished. It’s Cate Blanchett’s powerful performance that carries the film. Otherwise it's generally straightforward, but fans of Dawson’s Creek nymphet Katie Holmes will find it rewarding, too. 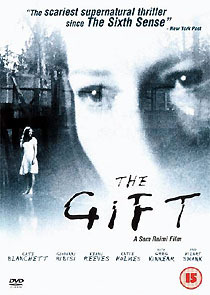 The disc comes with two supplementary features: The Gift – A Look Inside (10 minutes, labelled “Interviews”, for some reason), and a second short featurette (7 minutes – not the “15m” listed on the box). Five more minutes of choppy footage from the film's premiere, including cast interviews, is available as an Easter Egg accessed through the main menu. This and the featurette are exclusive to the UK version. The Region 1 version has a music video, Furnace Room Lullaby by Neko Case and Her Boyfriends, which is absent from the Region 2 disc. Two other features are exclusive to the UK disc, but amount to virtually nothing: the “Radio Spots” is a single ten second advert, and the “TV Spots” total less than two minutes.